Donations for Advent greens and Christmas flowers and are being accepted now through December 16. Envelopes and donation forms are located in the Narthex on the Ushers stand. 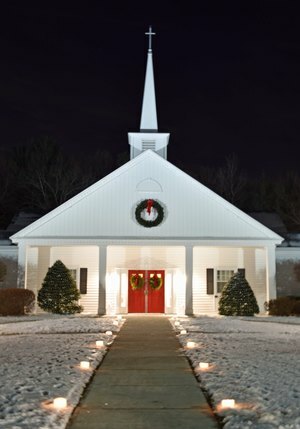 We would like to fill the church entrance sidewalk with ice luminarias again this year at the Christmas Eve services. Anyone can make them. All you need is freezer space to hold a number 10 size can. Contact Ken Bee for instructions, supplies, and questions. Call Ken 518-664-5830 or email him. Please be at the church on Sunday December 23rd at 1pm to help us prepare the church for Christmas. All hands are welcome and appreciated. As part of a mission & outreach project, we have created a Christmas Card with a beautiful picture of St. George’s. What a wonderful way to spread the joy of Christmas and support important Mission & Outreach projects at the same time. The cards are packaged in bundles of 5. We are asking $5, for the bundle. All proceeds will be divided among HAWS (Healing a Woman's Soul, “from domestic abuse and violence”) and St. Francis ministry with the refugees. Cards are on display at the table with the red tablecloth. Please make checks payable to St. George’s Church. Please write “Christmas Cards” in the memo. If you should have any questions, please reach out to Misty Quail at 518-378-8441 or email Misty.